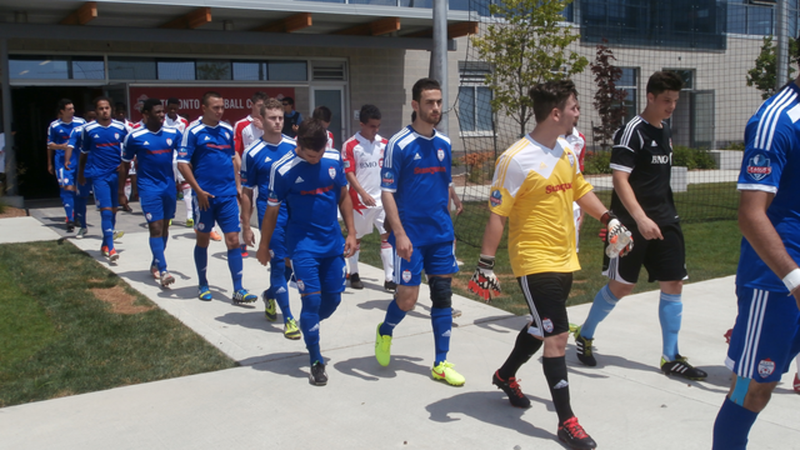 League 1 Ontario's current leading goalscorer, Molham Babouli, came on in the second half to extend his league scoring lead, and Toronto FC academy rallied from being down at halftime to edge the Woodbridge Strikers FC 2-1 Sunday afternoon at the Kia Training Ground at Downsview Park. The MLS club’s academy squad overtook the Windsor Stars atop the table with the win, and now sit on fifteen points after seven contests, while the visitors fell to fifth spot as a result of this loss, and Sigma FC’s home victory over Vaughan Azzuri. After a first half marred with wastefulness in the final third, TFCA bench boss Michael Stefano elected to jettison his plan of giving his big guns – Babouli and captain Christopher Manella, specifically – a day off after playing a full ninety minutes last Friday. The decision quickly paid off. “The three changes we made at the half clearly made a big impact in the second,” Stefano said in his post-match comments. The first shot in anger came in the fourth minute, when Jodah Daniel benefitted from a poor turnover in the middle of the park, attacked down the left-centre channel, and rolled a shot wide far post from just inside the box. Toronto owned most of the possession in the first twenty-five minutes, and capped off another nice move when Daniel shot sailed over the bar after an incisive pass from Marcus Godinho in the eighteenth minute. It was Daniel again who found himself in space in the twenty-fourth minute, cutting from the right wing to make an attempt at the near post with his left-foot. Yet, once again, he was off-target from the half chance. Woodbridge’s attempts to go through the packed middle of TFCA’s midfield meant the Vaughan-based outfit struggled in the first half to maintain possession, or create much in the Toronto half; Toronto’s 4-1-4-1 formation outnumbered Woodbridge’s 4-3-3 in the centre of the park. Yet it was the Strikers who would strike first, as Nicholas Chiarot rose above the Toronto FC defenders in the thirty-third minute to head home the game’s opening goal from a well-placed in-swinging free kick by Vincenzo Sasso. Despite the majority of possession and chances being held by the home side, the half ended 1-0 in favour of the Woodbridge Strikers. The hosts then went up a goal in the seventy-fourth minute after Luca Uccello charged down the right channel into the box, cut through a foul that the official indicated would be played as advantage, and poked the ball to a wide-open Oladapo Afolayan, who had no trouble beating Savone at far post. Woodbridge felt hard-done by in the eighty-first, after Cordon had been dropped in the box, but no penalty was forthcoming. Uccello nearly made it three when he connected on a pretty centring pass following a weaving run down the left from sub Dylan Sacramento, but his one-time shot was blocked on the line by the chest of a Woodbridge defender. A huge standout for TFCA was the defender Manella, whose composure and distribution on the ball was first rate on the afternoon. “The players really feed off of Chris’ calmness and patience with the ball at his feet,” Stefano said. Toronto FC academy is back in action on July 11, away to Internacional De Toronto; Woodbridge Strikers host Durham United FC on July 12.